Photographs showing the inside of Liverpool’s Bank of England building after activists left yesterday have been released. Merseyside Police entered the Grade 1 listed building on Castle Street in the city centre yesterday morning to evict anti-austerity protestors calling themselves Love Activists. 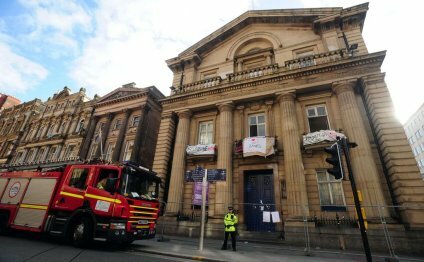 Liverpool council officers took these pictures showing the state of the building after the protestors left. It is not yet clear what condition the building was in prior to the arrival of the activists. The Love Activists had been occupying the empty building since mid-April, saying they wanted it to be used as a homeless centre. Some remained despite a civil court eviction order issued on April 28 giving them 24 hours to leave. Police swooped on the building, up for sale by a private owner through Mason Owen, yesterday morning saying they had no option but to forcibly evict the protestors after all attempts to negotiate with the group failed. A group of five ‘Love Activists’ charged with trespassing at the former bank all pleaded not guilty when they appeared at Liverpool Magistrate’s Court yesterday afternoon. John Rice, 22, James Allanson; 20, John Hall, 50; James Jones, 20 and Chelsea Stafford, 19, were all granted unconditional bail and are due to appear at Liverpool Magistrate’s Court on August 10 and 11.